Tag line: "The Loser Who Beat the System!" Whereas most of the men in his neighborhood work at the local factory, Aloysius “Quackser” Fortune (Gene Wilder) spends his days patrolling the streets of Dublin with a homemade wheelbarrow and a shovel, scooping up the valuable dung left behind by delivery horses and selling it as fertilizer to nearby homeowners. But life is about to get much more complicated for Quackser. First, he meets Zazel (Margot Kidder), an American student enrolled at a Dublin University, and before long Quackser is head-over-heels in love with her. Then, his livelihood is threatened by a new ordinance that, if approved, will force delivery services to switch out their horse-drawn buggies for motorized vehicles. Realizing their son might soon be out of a job, his mother (May Ollis) and father (Seamus Forde) try to convince Quackser to move to America, where he can live with his cousin in the Bronx. But Quackser isn’t ready to throw in the towel just yet, and with Zazel’s help he may find a way to beat the system and maintain his independence. Directed by Waris Hussein, Quackser Fortune Has a Cousin in the Bronx is an odd, offbeat romantic comedy that, thanks to the fine work of its star, you can’t help but enjoy. Sporting a convincing Irish brogue, Gene Wilder is at his likable best as the quirky title character who roams the streets of Dublin looking for manure and instead finds love. Kidder, in one of her earliest film roles, is equally good as the elusive Zazel, a flighty young woman who, though she has feelings for Quackser, is unsure about their relationship and maybe even a little embarrassed by it (she makes plans to meet Quackser at a dance, then shows up with a fellow student and contemplates sneaking away when she spots Quackser on the dance floor). Yet whenever the two are together, Zazel is clearly drawn to the older Quackser, and enjoys the time she spends in his company. The scenes featuring Quackser and Zazel are, indeed, well-handled and even quite touching, but Wilder is also strong when on his own; whether he’s selling his wares to a lonely housewife or being ridiculed by the patrons at the local pub, Quackser is the kind of guy you want to know better, and you hope like hell that everything works out for him in the end. 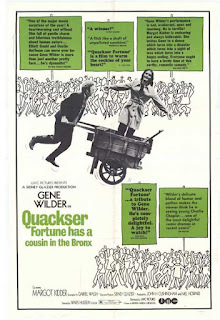 Though it stars an American (Wilder) and a Canadian (Kidder), Quackser Fortune Has a Cousin in the Bronx is an Irish movie through and through (it was shot on-location in Dublin, and in several scenes Zazel even rattles off a few tidbits of local history; facts about Dublin that she learned while at University). 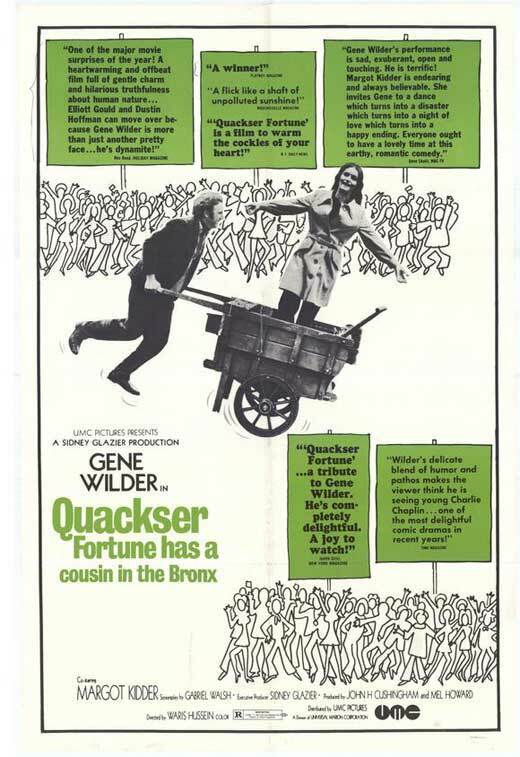 And thanks to Wilder’s performance and the smart, sentimental script penned by Gabriel Walsh, Quackser Fortune Has a Cousin in the Bronx proved to be one of the most endearing Irish films I’ve seen in some time. Hang on, Dave, Waris Hussein? The chap who directed so many early Dr Who episodes? Holy crap! (Sorry. Had to say it.) Yet another movie you've covered that I had no idea existed. Nothing new to say about Wilder--I've always liked him. And, gee whiz, Margot Kidder was so pretty when she was young! I'll try to see it.